The Time and Wage Calculation template for Excel allows defining roster schedules and will automatically calculate associated wage costs by staff, area, and department for each day, and the week. 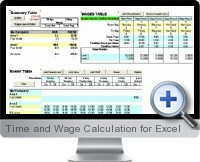 It uses a base wage and up to six additional wage settings to determine the wage structure. Wage classifications, and staff can be freely added. The Time and Wage Calculation for Excel roster format is by department and area, with two staff work periods per day to accommodate split shifts. Department, Area and staff can be configured to suit almost any business structure and size. Once you have set up your wage and roster frame work you can easily allocate staff to work periods to build your weekly roster and at the click of a button calculate wage costs by day and week. Standard Excel print functions are available providing flexible print formats. Using the Time and Wage Calculation template for Excel, you can define your roster schedules and calculate your wage costs with ease.